We all love to have pudding after our main course meal. Pudding can be eaten hot or cold. 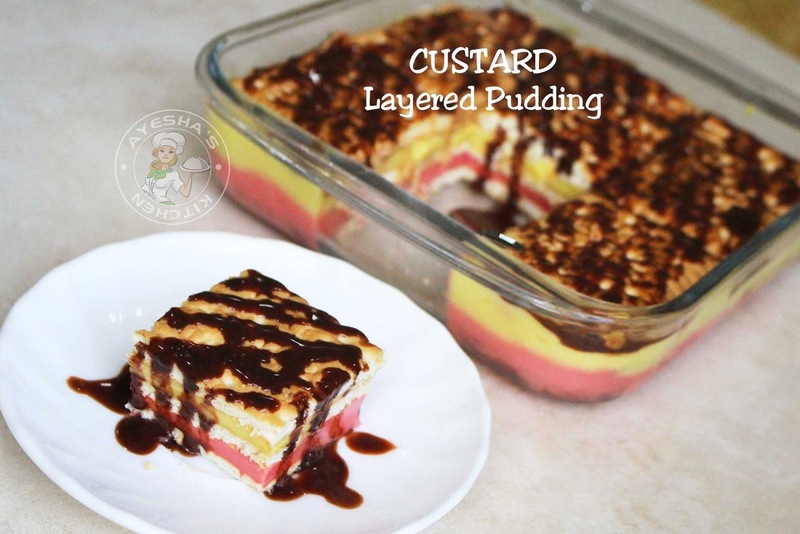 But i love to have creamy cold pudding which is one of the easiest and satisfying dessert recipes. For those who are looking for a simple, quick and less ingredient pudding recipes, do have a look at this yummy treat. This dessert recipe is very easy to prepare and yes it melts in your mouth. Of course, this pudding calls for very simple ingredients which are commonly available in our pantry shelves. I highly recommend all my viewers to give variety pudding recipe a try and drop your valuable feedback and suggestion in the comment box below. So here is the recipe showing how to make multi-layered custard pudding recipe. First, we can prepare the custard cream. For that take a bowl and add sugar, half a cup of milk and custard powder. Mix it well until combined without any lumps. Now boil milk (2 cups). When it starts boiling, add vanilla essence and mix well. Now make the flame to medium-low. Add the custard cream and immediately mix it until well combined. You can see the custard mixture starts to thicken. Let it cook for 4 to 6 minutes stirring continuously. Remove from flame when the custard mixture reach a thick flowing consistency. The consistency of custard cream must not be thicker. Set this aside. Then prepare the china grass mixture. Cook chinagrass along with half a cup of water until it melts to a clear liquid. When done, pour this prepared chinagrass to the custard mixture through a strainer and mix it very well. Transfer it to two bowls equally. To a bowl, add rose milk essence and mix it very well. Now lets assemble this pudding. Take the pudding tray. Layer some biscuits evenly as a base. Now pour the pink colored custard mixture over it. Again layer some biscuits and pour the yellow colored custard mixture over it. And finally, top the pudding with biscuits and let it keep refrigerated for 4 hours. When done, slice the pudding and drizzle some nutella cream (mix 2 tbsp of nutella with 1 tsp of water and make a smooth cream. ) over it for garnishing this dessert. 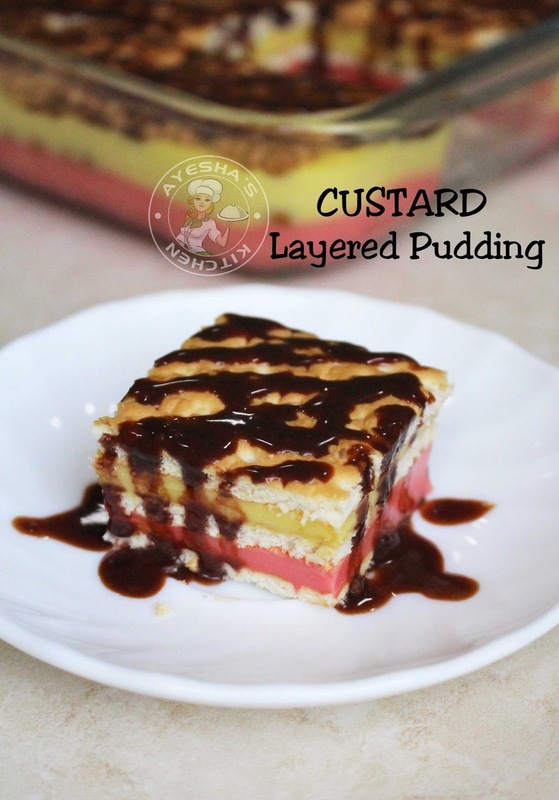 Yummy multi layered custard pudding is ready. 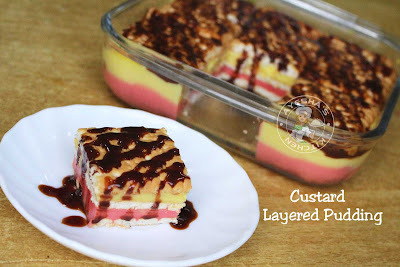 It is a must try pudding recipe. 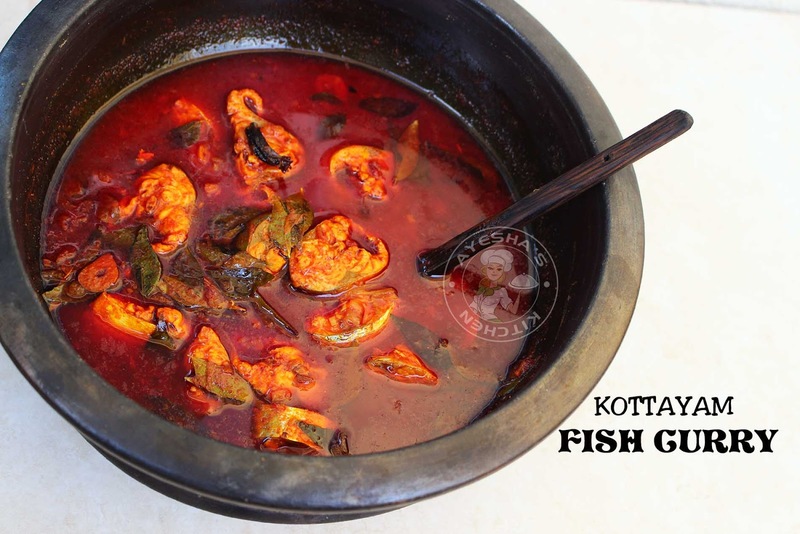 Kottayam fish curry is a red-hot fish curry recipe which tastes absolutely perfect along with steamed rice. This Kerala fish curry is very popular around the globe. In Kottayam, this fish curry is also known as Meen vevichath. Gamboge or kudampuli is the main ingredient which adds sourness to this fish curry. And so, this curry recipe is No tomato fish curry recipe. I have shared many fish curry recipes on my blog like Goan fish curry, Kerala fish curry, Indian fish curry, Malabar fish curry, No oil fish curry etc. 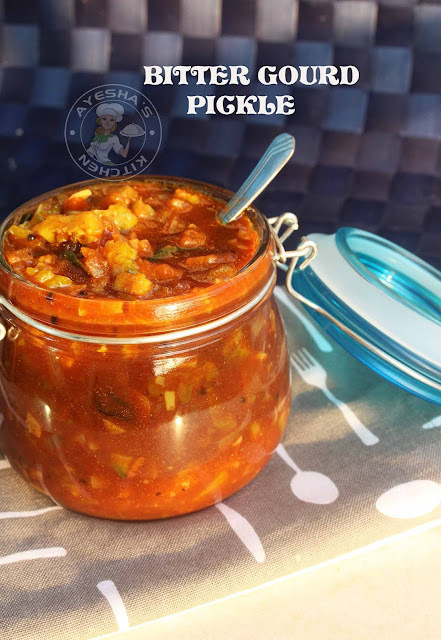 Do check my blog for a variety of fish curry recipes. So let us move on to the recipe showing how to make Kottayam style fish curry recipe / Kottayam meen curry. Clean the fish well and cut into small pieces. Drain it well and then set this aside. Soak the gamboge in water and set this aside. Now heat a clay pot (more preferred) with coconut oil (2 tbsp). Once hot, add mustard seed and fenugreek seed. Allow it to splutter and then add chopped ginger, garlic and green chilies. Saute for 2 minutes over a low flame and then add the chopped shallots. Saute until shallots turn soft and then make the flame to very low (which is very important). Now we have to add the spice powders. Add the turmeric powder along with Kashmiri chili paste (mix the Kashmiri chili powder with some water and add it little by little until it forms a paste). If you are using normal chili powder, then add less (than mentioned ) as it will be too fiery. Saute well over a very low flame until the oil separates or floats on the top (which is very important for getting the reddish color to this curry). When done, add the gamboge along with the soaked water and salt. Mix well. Allow it boil. Then add the water (1.5 CUPS). Again mix very well, cover it with a lid and allow it to boil. When it starts to boil, add the fish pieces. Swirl the pot. And then cook for 5 to 8 minutes or until fish pieces are done. When done, add quarter tsp of coconut oil on the top and remove from flame. Let it sit covered for an hour and then serve.... for the best result. It pairs best with steamed rice or chapati. Cheesecake, one of my family favourite sweet dessert. Cheesecake consist of one or more layers where the bottom layer or base will be often made from crushed cookies or sponge cake or graham crackers. 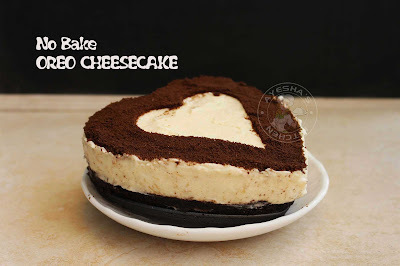 Here am going to share the recipe for a no-bake cheesecake. Yes, it is very easy to whip up a no-bake cheesecake and thus impress your friends and family. Oreo cheesecake, Mango cheesecake, Nutella cheesecake like so you can make a variety of yummy and creamy desserts. Oreo cookies in cheese cream are perfect for a party dessert idea. And I think this is the best way to make those cookies lovers happy. Moreover, oreo desserts are definitely a crowd pleaser. My Rose (my lil baby) will die for oreo desserts. So let us move on to the recipe showing how to make No bake oreo cheesecake. Grease and line the sides of the springform with butter paper and set aside ready. I took two mini springforms. Butter and cream cheese must be at room temperature. To the grinder, add Oreo cookies and grind it to a fine powder. To this, add softened unsalted butter and mix well to combine. Layer the prepared pan with this oreo mixture and level well with a spoon. Keep refrigerated for 10 minutes. Meanwhile, prepare the cream cheese layer. For that, add the softened cream cheese in a bowl and beat until creamy. When done, add the powdered sugar little by little. Beat until creamy. To this add vanilla essence and again beat well. Now add the cool whip (click here to see how to make it) to it (prepare the whipped cream and let it cool ) and fold well. Then add the melted china grass (cook the chinagrass in water until it turns to a clear liquid. when done, pass it through a strainer and set aside in a bowl) which is slightly warm. Or you can use gelatin instead. Whisk the chinagrass mixture until well combined. Now pour this prepared cream cheese layer over the oreo layer. Level the top and tap well. Keep refrigerated for 6 hours or overnight to set. When done, decorate it with oreo powder and serve chilled. 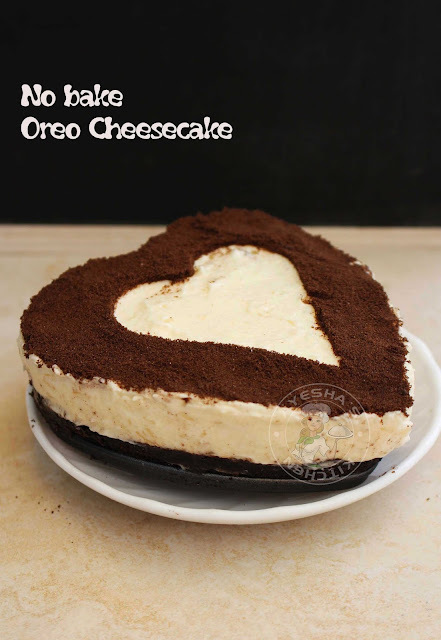 Please watch this video no bake oreo cheesecake. Bitter gourd/ bitter melon/ kaipakka is an excellent source of various vitamins and is high in dietary fibre. Bitter gourd contains twice the calcium of spinach, twice the beta-carotene of broccoli and twice the potassium of a banana. Moreover, the insulin-like compound in Bitter melon is suggested as insulin replacement in diabetics patient.Some of the health benefits of bitter gourd are as follows - bitter gourd helps to kill cancer cells, it helps in treating blood disorders, it is beneficial to diabetic patients, it helps to improve eyesight, it helps in boosting the immune system, it is beneficial for respiratory disorders and much more. It is better to drink bitter melon juice than using bitter melon in any dishes. But as it tastes bitter, we refused to drink bitter melon juice. 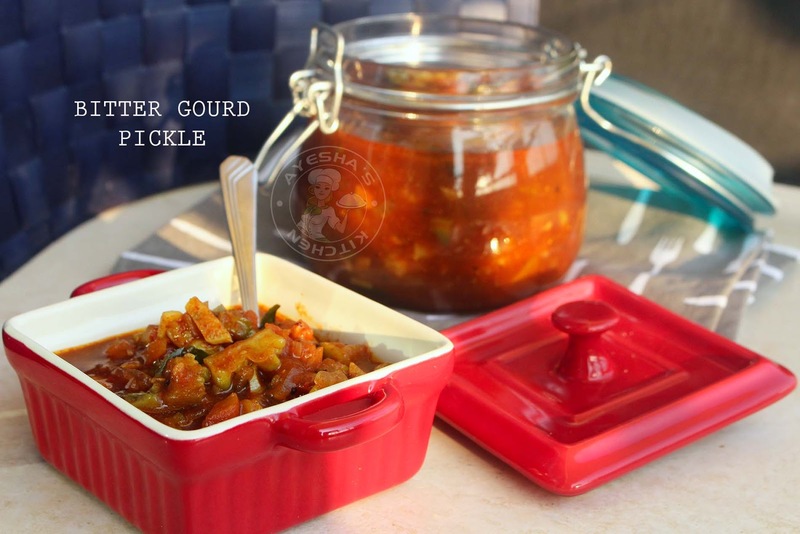 So here is my simple, yummy and healthy recipe with bitter gourd. Though the vitamins and enzymes will get destroyed in heat, you will still benefit a lot from its minerals and phytonutrients. 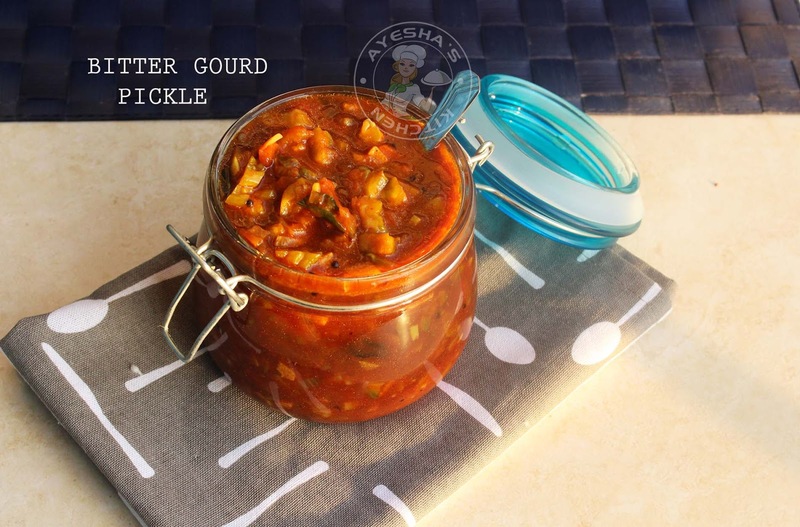 This pickle with bitter gourd is very healthy when compared to other pickles. Here all the ingredients are cooked together in a clay pot until done and finally tempering the pickle with very less oil. Still, it tastes very delicious and is very less bitter too. So let us see how to make bitter gourd pickle / kaipakka achar. In a clay pot (manchatti), add all the ingredients one by one. Mix well with a spoon. Add a cup of water and switch on the flame. Cover it and cook until the gravy thickens and the bitter gourd is done. (it will take around 15 to 20 minutes over a medium-low flame). In a pan, heat 2 tsp of coconut oil. Add fenugreek seed and mustard seeds. Let it splutter over a medium flame. Add curry leaves and pour this over the prepared bitter gourd pickle. Close it with a lid and for best result let it stay aside for 2 hours. You can store this pickle in an airtight container and keep refrigerated for weeks.